Now with the revised agreement having come into effect on January 1 and the recent release of 2018 goods and services trade data by the U.S. Census Bureau, we can evaluate and close the books on the original KORUS FTA. 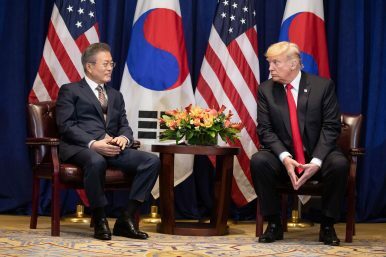 In the agreement’s early years the concerns raised by Trump and others stemmed from the unexpected rise in the U.S. merchandise trade deficit with South Korea and the stagnation of U.S. exports after the KORUS FTA was implemented in 2012. From 2011 to 2015, the U.S. merchandise trade deficit with South Korea rose from $13.2 billion to $28.3 billion, while U.S. exports to South Korea declined during the first two years of the KORUS FTA. In tandem with concerns about the deficit, Trump and others suggested that the KORUS FTA was costing the United States jobs. Trump went so far as to suggest the figure could be as high as 200,000 jobs. If the first few years of the KORUS FTA did not provide the expected results, the picture has steadily improved since 2016 and the recent data suggests the agreement may have been fair after all. In 2018, the United States exported a record $57.5 billion in goods to South Korea, up from the $45.2 billion exported before KORUS and more than 16 percent higher than the previous record in 2017. Compared to before the FTA, U.S. merchandise exports to South Korea are up and U.S. services exports have also grown by 27 percent. The growth in U.S. exports in recent years has helped to reduce the trade deficit with South Korea. The U.S. merchandise trade deficit has declined by over $10 billion in the last three years and the overall trade deficit is slightly below where it was prior to the KORUS FTA’s implementation. With the overall trade deficit now below its pre-KORUS level, the KORUS FTA would have served as a source of job creation based on the metric used by those with concerns that the agreement had cost the United States jobs. The decline in the overall trade deficit with South Korea also contrasts with the United States’ trade deficit with the world and with other major trading partners. The overall U.S. trade deficit has risen by 23 percent over the last two years, while the overall U.S. trade deficit with South Korea has declined by 68 percent and now accounts for less than 0.9 percent of the overall U.S. trade deficit. Put in the context of other major U.S. trading partners, South Korea also stands out. While there is still a deficit, South Korea is no longer among the United States’ 10 largest bilateral trade deficits and the year-on-year decline of 22 percent is the largest decline in the trade deficit among major U.S. trading partners. It also contrasts with countries such as China, Mexico, Germany, Ireland, Malaysia, and Canada, which all saw their deficit with the United States increase by at least 7 percent. What has driven the growth in exports to South Korea? Major export categories such as machinery, chemicals, and transportation equipment all grow by more than a $1 billion since KORUS has gone into effect. U.S. exports of automobiles have grown from 12,541 vehicles in 2011 to 53,274 vehicles in 2018. Even in the case of agriculture, where the value of some exports is down due to a decline in commodity prices, volumes are up. While there has been progress in multiple areas, a significant reason for the trade deficit’s decline and the growth of U.S. exports has been the surge in exports of crude oil to South Korea, which is now the second largest importer of U.S. crude oil after only Canada. This has been made possible by the shale gas revolution, which has helped to make the United States an energy exporter, and the removal of tariffs on petroleum imports under the original KORUS FTA. Since the implementation of the KORUS FTA, South Korea’s imports of U.S. oil and gas products more broadly have grown by 9,647 percent from a small base to become the top export category for the United States to South Korea. Demand for U.S. crude oil is expected to continue to grow in the first half of the year as it has become more competitive against oil from the Middle East. While the revised NAFTA awaits congressional approval and the Trump administration continues to negotiate agreements with China, Japan, and the EU, the renegotiation of the KORUS FTA represents Trump’s first major accomplishment on trade. It also remains one of the administration’s bright spots on trade, as the last two years under the original agreement have seen exports grow and the trade deficit with South Korea decline. But as the original KORUS history suggests, the first few years might be too soon to determine whether the changes made to KORUS FTA are beneficial or not.